The Humanists of the Renaissance created schools to teach their ideas and wrote books all about education. One of the most profound and important schools was established and created by Vittorino da Feltre in 1423 in Mantua to provide the children of the ruler of Mantua with a Humanist education. Humanists sought to create a citizenry able to speak and write with eloquence and clarity, thus capable of engaging in the civic life of their communities and persuading others to virtuous and prudent actions. Humanist schools combined Christianity and classical texts to produce a model of education for all of Europe. During the Renaissance, Humanism played a major role in education. Humanists —proponents or practitioners of Humanism during the Renaissance—believed that human beings could be dramatically changed by education. The Humanists of the Renaissance created schools to teach their ideas and wrote books all about education. Humanists sought to create a citizenry able to speak and write with eloquence and clarity, thus capable of engaging in the civic life of their communities and persuading others to virtuous and prudent actions. This was to be accomplished through the study of the humanities: grammar, rhetoric, history, poetry, and moral philosophy. The Humanists believed that it was important to transcend to the afterlife with a perfect mind and body, which could be attained with education. The purpose of Humanism was to create a universal man whose person combined intellectual and physical excellence and who was capable of functioning honorably in virtually any situation. This ideology was referred to as the uomo universale, an ancient Greco-Roman ideal. Education during the Renaissance was mainly composed of ancient literature and history, as it was thought that the classics provided moral instruction and an intensive understanding of human behavior. The educational curriculum of Humanism spread throughout Europe during the 16th century and became the educational foundation for the schooling of European elites, the functionaries of political administration, the clergy of the various legally recognized churches, and the learned professionals of law and medicine. A painting symbolizing the liberal arts, depicting individuals representing the seven areas of liberal arts study, all circling around Plato and Socrates. One of the most important Humanist schools was established by Vittorino da Feltre in 1423. The school was in Mantua, which is a small Italian state. The ruler of Mantua had always wanted to provide a Humanist education for his children, and the school was a way to help him. Most of Feltre’s ideas were based on those of previous classical authors, such as Cicero and Quintilian. The main foundation of the school was liberal studies. Liberal arts were viewed as the key to freedom, which allowed humans to achieve their goals and reach their full potential. Liberal studies included philosophy, history, rhetoric, letters, mathematics, poetry, music, and astronomy. Based on the Greek idea of a “sound mind,” the school in Mantua offered physical education as well. This included archery, dance, hunting, and swimming. The children that attended the schools were generally from upper-class families, though some seats were reserved for poor but talented students. Females were not usually allowed to attend, but were encouraged to know history, learn dance, and appreciate poetry. Some important females that were educated during the Renaissance were Isotta Nogarola, Cassandra Fedele of Venice, and Laura Cereta. Overall, Humanist education was thought at the time to be an important factor in the preparation of life. Its main goal was to improve the lives of citizens and help their communities. Humanist schools combined Christianity and the classics to produce a model of education for all of Europe. 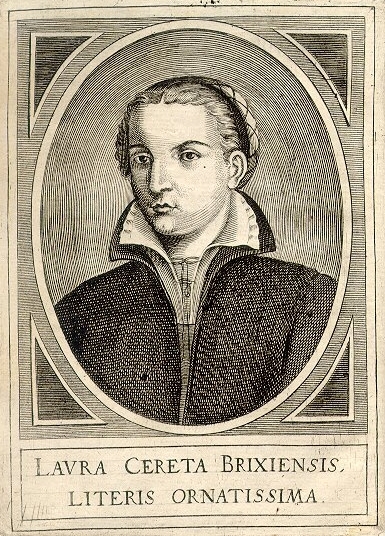 Laura CeretaLaura Cereta (1469–1499) was a Renaissance Humanist and feminist. Most of her writing was in the form of letters to other intellectuals.